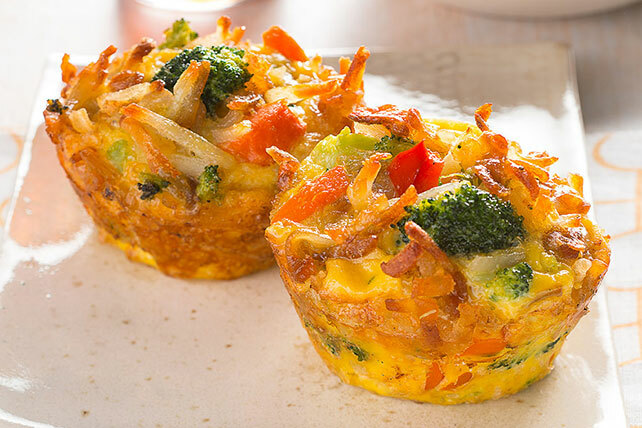 Watch our video to learn how to make Cheesy Egg and Veggie Cups! These mini egg and veggie cups are full of colorful veggies & Parmesan cheese. Heat oil in large nonstick skillet on medium-high heat. Add potatoes and fresh vegetables; mix lightly. Cook 6 to 8 min. or until potatoes are browned, stirring occasionally. Spoon into 12 muffin pan cups sprayed with cooking spray; top with cheddar. Whisk remaining ingredients until blended; pour over ingredients in muffin cups. Bake 15 min. or until knife inserted in centers comes out clean. Cool 5 min. before removing cups from pan to serve. For a delightful brunch idea, serve these Cheesy Egg and Veggie Cups with a seasonal fruit salad. Substitute water for the milk.